With over 30 years of experience in the industry, Stodec Products have the skill and expertise necessary to provide the highest quality design, installation and maintenance services for clean rooms across the country. The design and installation of clean or controlled environment areas, such as modular cleanrooms, requires both a detailed understanding of your operational requirements and of the site conditions and limitations. Our specialist division The Cleanroom Company has many years experience in installing facilities such as laboratory furniture and modular cleanrooms both in the UK and in many overseas countries. We can include particulate filtration, close temperature control, humidity control, fume extraction, static dissipation, and any other environmental condition unique to your process. 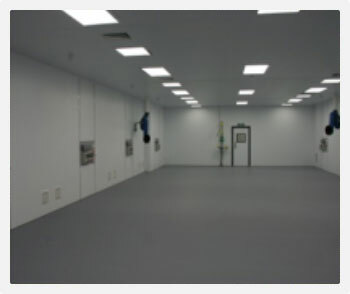 We can even provide partition panels with lead lined cores to give radiation protection if required. Some of the locations we have previously carried out projects include pharmaceutical, aerospace, optronics, electronics, precision engineering, food production, computer repair, medical and biomedical facilities. Every project is managed carefully from initial survey to installation and maintenance, and our skills allow us to offer the flexibility needed to meet your requirements. Our client, a worldwide £50 Billion turnover consumer product company, was relocating its research and development facility from its outdated and costly to maintain premises to a new location in Bracknell. Area² were appointed as Main contractors and Stodec Products Cleanroom Division successful won the tender process. Area² and Stodec’s Cleanroom Division working together as a team effort, completed the fast-track project, of which nearly 50% was service supplies, in 16 weeks and on budget and programme.